I spent a week with you at Suomenlinna. A week with meaningful conversations, deep circles, flowing dialogue, collective insights, delicious food, stunning beauty around us, surrounded by sea, cliffs and historical buildings. 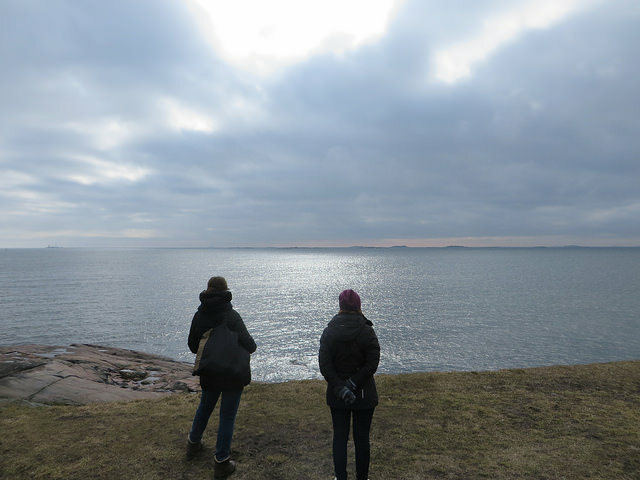 On the whole I felt connected – to you, to Suomenlinna, to our shared purpose. At times I felt confused, impatient, surprised, empowered, loved, touched, balanced, surrendered, and this is just to name a few of the flavors. I was aware, though, that no matter how bitter-sweet it would taste, the connectedness of our shared purpose would eventually catch me. I left with many questions – and found some answers, too. What is enough of a structure and what is not? What are the most important unseen elements we should see? What are the corner stones for this kind of happening? What did we learn from this – as a group, as individuals, as organizers, as hosts, as participants? As the dust starts settling down I know will see many more insights coming. So far I am making an attempt to describe what led us to come to Suomenlinna Learning Village. How did it turn out and what really happened during those days together? Juha and I sat down at a dinner table in Fairytale Castle, a nicely named hotel close to Otavan Opisto where we had the 4th Art of Hosting training taking place. Juha mentioned that he was running the Helsinki International Artist Program at Suomenlinna and that he was keen on organizing some event there, connected to some aspect of sustainability or new economy. Then next day we had the Pro Action Cafe session. Jan-Erik asked me to join in the process but we had no clue about the project. We sat at our table with an empty flip chart paper. `How about Learning Village?´ Jan-Erik suggested, and I felt inspired. Ok, enough for a topic, let´s start playing. Vilma came along and infused some action energy into the game. 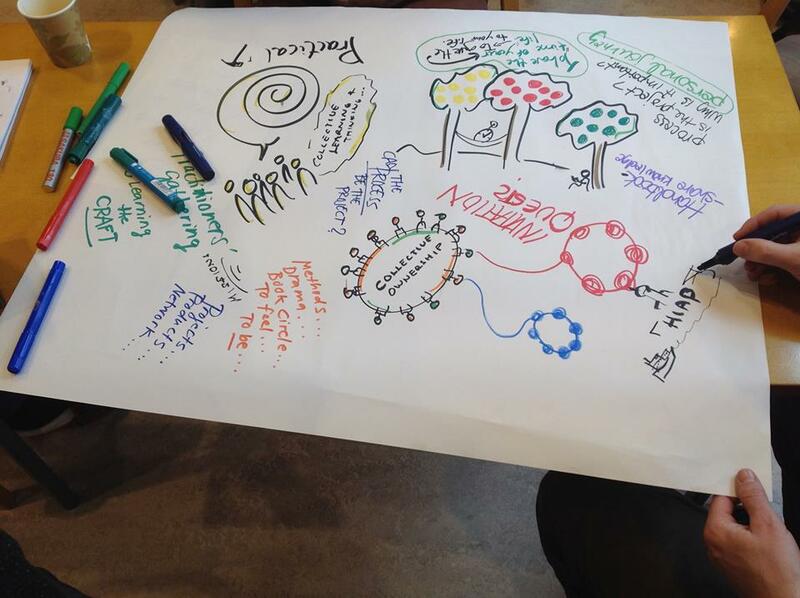 Ideas of potential places were brainstormed: somewhere close to Helsinki in order to make it accessible for everybody. On the second round Juha came to our table and said, `Hey guys, it sounds like an excellent idea, and I have a place for you. 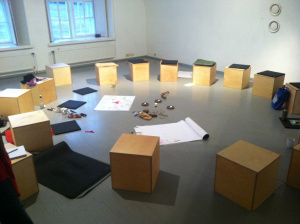 It is Helsinki International Artist Program´s Gallery at Suomenlinna. We stared at him as we were slightly knocked off by this miracle fallen into our laps. There were only yes- sentences: yes, it is a good idea, omg what a place, yes, we definitely feel inspired, and no, there is no way to say no to this opportunity. As for the challenges, we felt we had to be careful not to close the process too soon. And – yep we had no clue about the calling question. We started exploring what it meant for each of us to be part of creating the learning village. What were our deeper motives, and why did we feel like being a part of this? It felt pretty important considering the abrupt start of this journey. My personal fear was about not having a calling question that would lead us through the process but would rather lead us to doing something merely out of eagerness – that would radiate into the process. I was looking at myself. What is this project for me- what is my connection to it? There was something I could not put my finger on. In retrospect it was about Suomenlinna, a place which I had not visited for ages. In my mind it was this interesting museum island in front of Helsinki, where everybody goes in July because its cliffs are so ideal for sun bathing. Anybody seen any calling questions floating by? Nope, we didn´t know that yet. 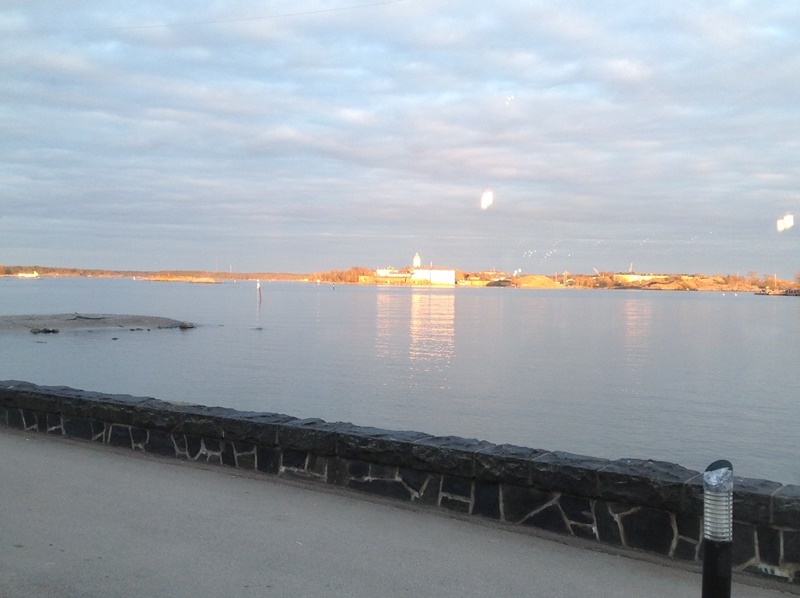 It was the beginning of October, and we decided to visit Suomenlinna. The sun was shining, the sea was peaceful, and everything looked bright and colorful. As soon as the ferry left the market square I felt thrilled, as if some bigger forces were supporting us. At Suomenlinna it felt crystal clear that we were on the right path and must do the Learning Village. The place was so vibrantly calling for it. The power on the island reminded me of Findhorn, an ecovillage in northern Scotland where I had lived for some years. Juha told us there had been some brainstorming about the future purpose of Suomenlinna. It is an old fortress island with a lot of stone walls, and there have been some dark times in its history. Heavy brick-form memories. During the Finnish civil war in 1918 there was a prison camp of 8 000 prisoners. Many of them were executed and some died of diseases due to the poor conditions in the fortress. It had been a sort of a concentration camp. How about Suomenlinna being a transformation center for new structures? And what if our calling question was about transforming structures? Something to do with the future we wished to be part of. A lot of energy was felt there. Transformation, structures and future – they were some key words and building blocks for sure. The elements of the calling question were finally landing. After our visit I was not so worried about it anymore. I trusted we were a part of some bigger picture despite the calling question still being under construction. We started doing all the practical things, e.g. created the Facebook group, opened the website (https://learningvillagesveaborg.wordpress.com), created the Facebook event and spread the word about the event. We made the design and the hosting process as transparent as possible. Who ever felt inspired was welcome to join– it was our first action towards the liberating structures. Eventually we got really lucky and some happy co-incidents took place, too. One by one Amanda Fenton, Lena Jacobsson, Rainer V. Leoprecting and Nancy Bragad joined the hosting team. The circle practice was a common element for most of us. Then we got a message from Viola Tschendel, graphic recorder and a graduate from Karlskrona´s Blekinge Institute, whom we had met in the Copenhagen Learning Village. Suddenly the whole gang was there! The designing was planned to happen on the pre-day, on the 27th of March. It was open to anyone wanting to be part of it; another experiment to keep the design process as transparent as possible. The emphasis was on self-organizing, leading to transformation and the future we wished to be part of. Trusting the process, trusting oneself and acting out of trust. The calling question – now formulated into a very simple one- allowed space for different approaches: what is the future we wished to be part of? What do we want to leave behind? What are the key aspects we want to take care of on a deeper level? Hopefully the process could reveal which aspects would be more meaningful ones, would be the building blocks for a better future. The invitation was crafted to attract people from various fields and not only the Art of Hosting practitioners but also other change agents from different areas of society, such as business, education, politics, arts and media. There were lots of tiny little details about the food, accommodations, invoicing and bookings and thanks to Juha, we received so much help from HIAP´s Stephanie Rotko and Ulla Linnanvuo. The number of participants steadily increased. It was clear straight from the beginning that we were not doing this to make money. As for the pricing we took a hint from the entrepreneurs side and offered a special price for sole and social entrepreneurs. We tried to be flexible and arranged a sliding pricing scale for individuals who could not stay for the whole time. We also offered a crowdfunding option to support the participants with a tighter financial situation. Eventually we got 45 participants plus the hosts, so altogether 54 people joining the experience of transforming structures and creating our future; extraordinary people from different corners of the world and from many fields of society, such as NGOs, business, art and education. The 27th of March arrived. Our international hosts had already arrived as I walked to Tobias –one of HIAPS Galleries with Vilma, my Finnish co-host and Niilo, a villager whom we had accidentally met on the ferry to Suomenlinna. Jan-Erik had kindly brought most of the facilitation equipment in his car as well as welcomed hosts who one by one had arrived to this windy and cool island – the weather had suddenly changed and showed some rougher sides of the Finnish Spring. After some Skype calls it was great to meet in real life. We sat at the upper floor of Tobias, had a check-in circle and listened to the strong sounds of the wind. It was one of the first circles we would have that day. Exciting! My body was full of energy but I felt grounded, too. It was such a treat to have all these brave (= somewhat crazy) hosts coming all the way to Finland. I knew we were on a path to the unknown but I would rather go there with a bunch of lovely people than alone! We had lunch at Chapman´s and walked in to Gallery Augusta for the first time with the whole gang of hosts. Such a spacious place and soon to be transformed into a welcoming Learning Village center. We toured around the gallery and created the center for the next circle, now open to anyone wanting to join the design process. Little by little people dropped in, more chairs and pillows were added into the circle. We shared about what had called us to the Learning Village, what were our hopes and expectations. Elements of reaching out to the future were put into the center. Circles can feel slow. But they also create good, grounded, womb-like energy. It is where everybody can build connection to the shared purpose, get to know each other, and build the common field. The sun set down, the storm slowed down. We started feeling cozy at Augusta. Rainer suggested we would do a systemic constellation on the Design. Constellation would help us to see a holistic picture of a situation. It could show the different elements involved with the process and point out where the healing needed to take place. It sounded like a good idea; let the process tell what it needs, especially as we were on the path of exploring what really was needed. A picture that emerged in front of us was a complex image of simultaneous and overlapping systems. There were certain key elements: Suomenlinna, its people in the past, transformation of structures, participants, participants that were not yet present. What touched me most was the strong connection to the place and its people in the past. As we came together and shared about insights happening during the constellation I felt a strong relief in my stomach when I told about my insight. For me it became obvious the place itself was one of the containers and callers. It is why we were offered gallery Augusta in the first place. The past needed something in order to become part of the future. Like Rainer said: why wait, live the future now. Maybe Suomenlinna was a crossroads where the elements of past, present and future could came to one and allow us to live the future now. We started the morning by doing a check-in circle where everyone was welcome to join in. Gallery Augusta went through some multilevel transformation. For the next six days it would become a village center where the learning and inspiration would take place. Our main circle was in the middle of the space. We had empty boards leaning on the walls, ready for harvesting and other action. Felix made some landing marks on the floor. There were titles like work, self-expression, home and creativity. People could add their responses on post-it stickers and put them on the platform paper. Something to think about, to orientate into the process. There were sofas and mattresses in the opposite corner for resting and reflection. More participants arrived. Hugging specialists like Maria, Nancy and Wilma made them feel welcome. Wilma expressed some missing words by whistling. It was an ongoing invitation to join the social field we were creating together. What was peculiar was that it felt like everybody had been there already since the day before when we started the first circles. We joked that the center of the circle was our love boat, and in retrospect it was not far from truth. The whirlpool was rolling slowly and calling us for our individual and collective journey. We were living in a mini cosmos on spaceship Earth and ready to take off into the future of co-creation. Somebody rang the bell, and we sat in the circle. People introduced themselves; for some it was the first circle here, for some god knows which one. New people entered, and the circle got widened and rooted people into the process. We were living in the circle field; it was our village form. Our hosting team was pretty much going with the flow. It felt like a constant movement between the center and the periphery. There were waves of energy which we were listening to. When the center was energized the rest just went on, humming sounds here and there. The kitchen was filled with good smells. We had freedom to choose what to do while tuning in with the whole. It was all good. We opened the market place for Open Space sessions. At first the wheels rolled slowly but eventually the market place got crowded. As the day went on we could see the structures we had had: check-in, Open Space sessions, lunch, Open Space sessions, dinner and something fun for the evening. There was some discussion about what was the least minimum and if there was something worth adding or definitely removing. We were on a quest for sensing, using our hunches. For participants it meant more responsibility on self-management and use of the law of two feet. Whenever they would feel they could not learn nor contribute to the process they were invited to do an inner check-in, make an intervention or leave the process. As holders I felt we were on a mission of creating suitable structures for emerging processes. Enough structures to hold the process, enough space to get into the groove. Where was the ideal point of balance? The feelings of safety and trust were important yardsticks for sure. The atmosphere at Augusta felt so good. What was it exactly – was it Suomenlinna, the participants or the center? Or maybe it was the constellation work that was done before anything? It felt good, and it was needed. Fear had been a topic in some circles in the beginning. To be here, to come to this island demanded some courage. Not necessarily because it is a windy, rough fortress island in front of Helsinki but due to something else. People had felt resistance and reluctance to come; some had even gotten sick. Maybe it was about sensing some new elements coming into being- individually, collectively? Something to do with ourselves and the future we wanted to create? On the first evening we had a special guest visiting us – Mr George Magnus Sprengtporten, the contradictory character in the process of Finnish evolution towards autonomy. He took us to his premises, to a big brick cave somewhere on the island. Very handsome was he considering his mature age and not too gore-tex with his velvet costume either – but in that dark brick cave he made us vividly experience the illusion of dualism, the creative powers of yin and yang, the uniting forces that led to giving birth to something new. A fairly fitting describtion for the next few days ahead us. We had talked about the process design in the hosting team, in the context of divergence, groan zone and convergence. For those not familiar with the terms, it´s the jargon describing the process of opening up and the endurance to keep our hearts and minds open while dwelling on the edge of chaos. It is there where the creative sparkles can happen, where the collective breakthrough can take off. The Process Work uses the term `secondary process´ apart from the actual primary process, which in this case would be the event itself. At the Learning Village those emerging moments were crucial and constantly overlapping. Everybody had their own rhythm, affecting the group´s waves, and all of us could add elements to both. Since the hosting process was done in the most emergent way, it created space for secondary processes within the hosting team, too. Last but not least, one aspect of the container was very special- meaning Suomenlinna- so we had plenty of elements for an extra ordinary event! We didn´t have exact arrival or departure days. Some came for a day or two, some for the whole time. The total length was 4 days, (+1 pre- and+2 – post days), so altogether seven days. In terms of participation the peak was on the weekend, on the first two days. The law of two feet was intensively practiced. This was an experiment we were all responsible for. Somewhere there was a groan zone lurking –a phenomenon to be seen. Our village´s little waves were coming and going, breathing people in and out. Visually the process looked like a curly sausage. A very yoga like. In the evening we had an international dinner buffet where everybody could bring dishes from their home country. It was Sunday evening and the weekend was nearly finished. Some people were already leaving. 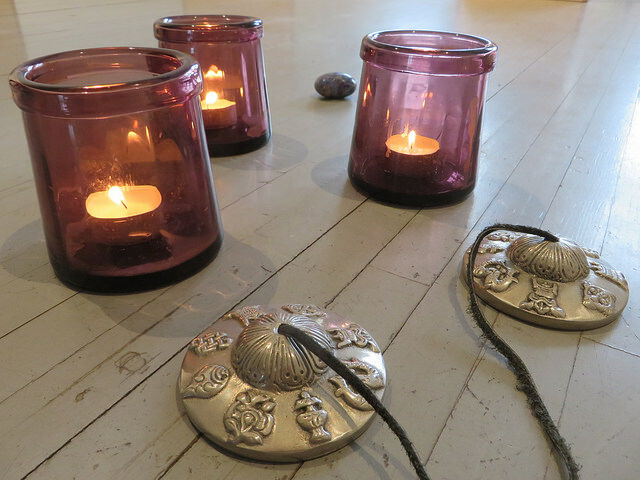 There was a possibility to go to saunas- to take time for transition or reflect on the past two days. As we woke up for Monday the 30th, the scenery had remarkably changed. Everything was covered with snow and brought feelings of Christmas. The participation vacuum from yesterday was refilled with a bunch of new people. Feelings of action were in the air. Hosts ran into each other at breakfast – we had no fixed meeting times – and wondered whether it would be the time for Pro Action Café. We had a big opening circle, almost like the first one on Saturday. Tanja placed a baby spoon in the middle of the circle, and it felt like a part-two of the story initiated at the cave on Saturday night. Would this be The Day – we would give birth to something that ensured a better future? Well, first ourselves. We opened the Open Space. The market place got filled up fast. The idea of having a Pro Action Café was hanging in the air until lunch. It came up naturally, as it fits well with this kind of action oriented phase. Rainer, the co-founder of Pro Action Café and Felix, his colleague and friend from Austria opened the process. New projects connected to the future were introduced. I ended up at Cris´s table talking about an ecovillage project in Romania. 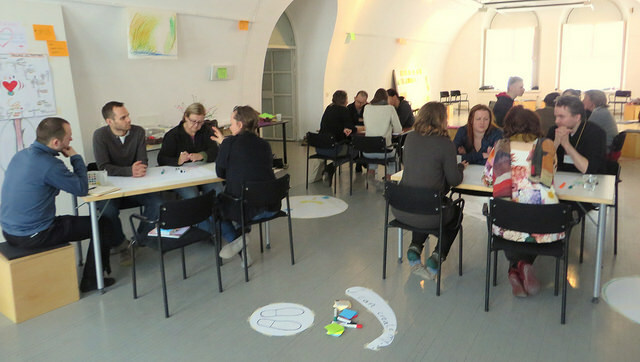 Then I switched off to Erica´s table: how to engage Åland´s government in sustainable planning. And for last third round I explored the next steps of Niilo´s life. It was our day three, for some day four, for some day one. At the closing circle we found ourselves talking about some serious stuff. What is the right kind of design? Who decides about that? Should we have Open Space sessions all the way through? Welcome to swim, it is our shared lake, and we all have something at stake here. We went around the corner stones of the calling question- transformation, structures, personal and collective. Some barriers needed to be transformed, inside of us, in our group, in the system. If there was a process map, the timing of groan zone was there. Lena mentioned she had been wondering already when that would happen. We played with the cards given that day. Transparency on the design for the day was at the core of the process ­­­­­- was it our collective decision? Erica said it is important to name whatever there is. What we name then transforms. We discussed the issue for a while and practiced graceful releasing. Let´s meet in the morning with those who want to be part of the design session. The lovely dinner at Pirunkirkko was already waiting, leading to furious dancing later in the night. Tuesday, the 31st. As agreed the design team (anybody interested in it) met in the morning and discussed the design for the day. The design process was as transparent as possible. It was the first day we had an actual design meeting and announced day hosts. As for the design we decided to continue with the Open Space. It was the last official village day. Nancy did a check-in circle where everybody could choose their place at the circle according to what time they were leaving. For the rest of the day we would have Open Space sessions. At the opening we re-connected with the calling question, the future we wished to be part of, and invited it to be the source of inspiration. It felt like there was a need to acknowledge the basic structures in order to make the creative forces flourish. It was a good reminder of the minimum structures. In the afternoon my process of having a closing circle hit on. Closing circles crystallize the main insights, close the process and help to move on. It was the day of many leavings. On the other hand people had been coming and going since day one. Some had even returned. Many would still stay for the post village days. 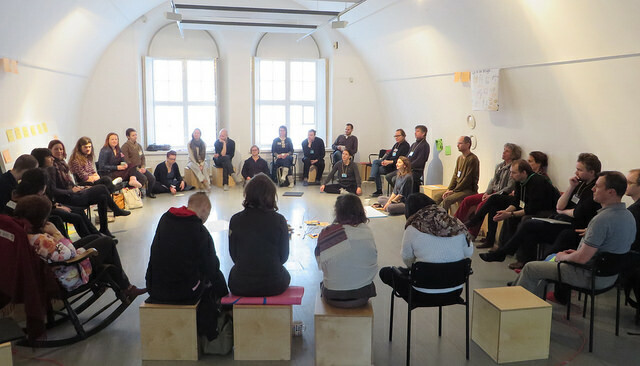 Rainer offered me an insight about having a closing circle as an open space session –yeah, why not. It was pretty much the nature of the process here. We were closing one part and entering into something new, reflecting and orientating for the next steps. In the evening we had another closing circle with the hosting team. We processed the most relevant questions and insights for each of us, incorporating them into being. Many questions came to my mind: how can we help people to feel present, centered and safe? What are the minimum conditions for that? How much does it depend on where we are with the process? How can I host myself so that I can host others? The never ending practice. How transparent should the design process be? That was a topic we were dealing with a lot here. The art of slowing down in order to speed up was such a relevant factor for emerging insights. To ponder all the questions and still be held by the village form was helpful during the closing part of the Learning Village- the “post” village days. We still had some minimalistic structures like a check-in circle in the morning and a very relaxed version of Open Space, Martin as our scribe. A smaller group size allowed flexibility with the logistics – workshops emerged at the right time with the right people, meals were co-organized and sauna was available. We were entering the appreciation part of the process, and Tanja´s ranking workshop was a good add to that. The market place of the Open Space had been shifted more or less to Facebook. It very much reflected the next phase of the process; we were slowly reaching out to the world while harvesting the main insights. What factors contributed to the process of the Learning Village? There were many that were invisible, and some of them even unidentified. Circle was was our main operational tool, infused with the Open Space. Energetically it contained everybody, no matter for how long or short they stayed. It seemed the circle practice along with the constellation work in the beginning created a powerful container for the whole time. Open Space helped us to create the reality for our mini cosmos. It called us to be true to ourselves, to follow our hunches and thus support the system. 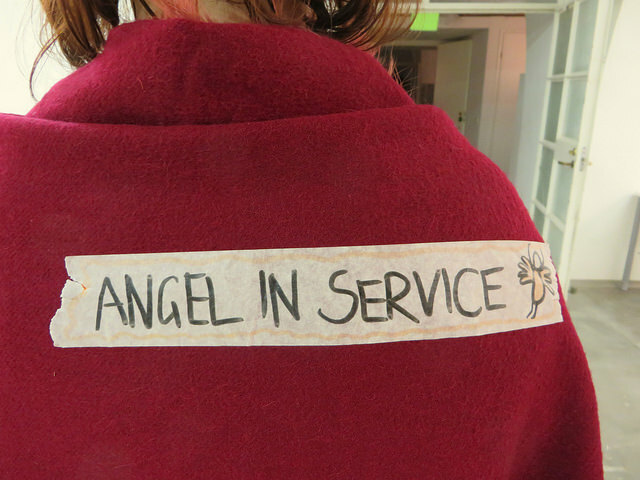 Everything was equally important: sleeping, dreaming, hosting a workshop. 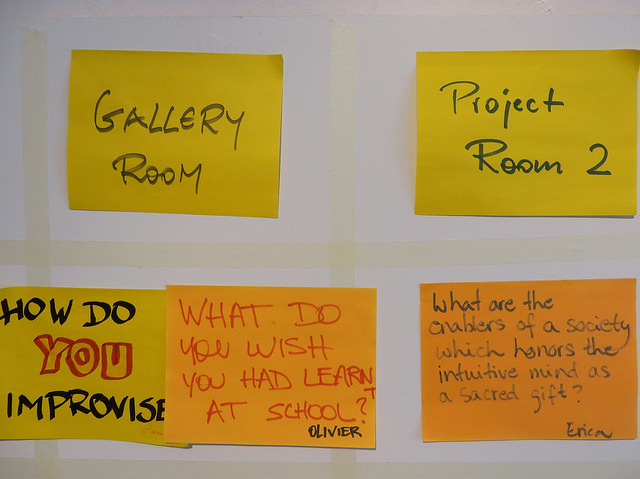 Just being in the mindset of Open Space was empowering – we practiced the law of abundance. Sometimes we stretched the envelope a little more –like `let´s not have any assigned teams to prepare our meals, let´s assume it will work out fine´ (yes it did and we also had Lena…) At times our “system” was a little slow, but when it got an impulse to solve an issue, it self-organized nicely. 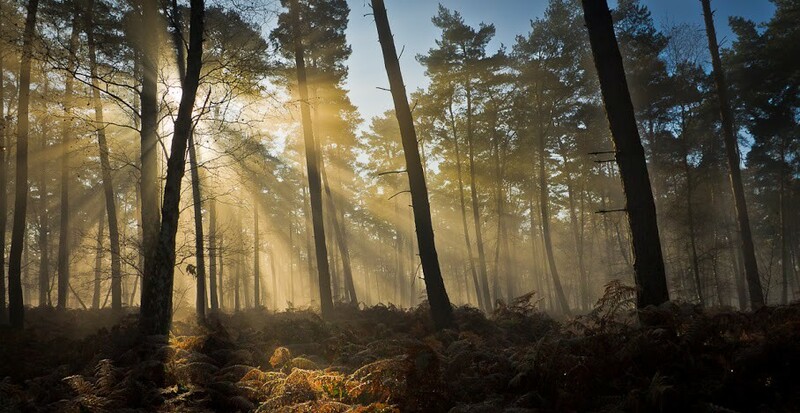 This brings the issue of trust to mind, to trust the abundance of life – the great assumption that was built within the Open Space and our week together. How to keep the web of trust so solid that it can hold everybody no matter where they come from? One circle practice principle seemed to be very useful at times: offer what you can and ask for what you need. Powerful, self-steering advice. (And be aware of your impact on the system, too). From the hosting perspective the Learning Village offered an interesting exercise about tuning in with the center. If the center was energized everything was fine. If there was a lack of energy felt in the system there were holders ready to take care of the center. At times a conscious attunement could have made some transitions smoother but nevertheless the self-steering effect guided the process further. but was there something else, too? It was on the design day (the 27th) when we sat in the circle and somebody mentioned the place, Suomenlinna, could bring too much of Suomenlinna into the process. Considering we are here to create our future and Suomenlinna is pretty much of other things, too. It has historical buildings, brick caves, layers in time and history, a feeling of being “out there.” It used to be a fortress island, and it has served the arts and culture in the last few decades. Definitely the container consisted much of Suomenlinna: the elements of past, present and future. In order to transform barriers, we needed a strong container for that. What could be better than a masculine, brick-style fortress island that can hold feminine energies like compassion, trust and healing? By being such a dominant structure it created a safe hub where we could get in touch with our most important building blocks. Like love, for example. Boy, didn´t we come here to talk about some serious stuff? To transform the structures and create the future we wished to be part of? And that brings us to healing and love? Maybe we can´t find the next level without love. Maybe we are so stuck with our thought patterns that we need to shift our focus first. Maybe that is what we came to give birth here in the first place? In the hosting team we had wondered what is enough of a design, what are the minimum conditions, how to find a balance between being and doing. I give credits to us for being so curious as to play with the minimum design: calling question as our center, circle as a coming together point and the rest just coming in as it came. On the last night Amanda and I prepared dinner and talked about the experiences at Art of Hosting events we had had. I joked about us having such a “homeopathic” experience here in Suomenlinna that anything less emergent might feel like too much of a structure. There was something about it I had not anticipated, though. Some aspect of the social spirituality. The healing. And the power of Suomenlinna. They were in the center, too. Maybe that was partly due to the minimum design process. It allowed space where the healing could take place. The space in between the past, present and future. The connection between the earth and spirit. The invisible circles. Maybe we needed to go through that funnel of healing in order to do our next bit in the world. I like this kind of simplicity. The future just asks us to take the next achievable step. For example: how can I keep my heart open and support others to do that too? Some shift is happening right now. We need systems to which we can commit wholeheartedly and that enable sustainable changes. We need more of a holistic world view. Some facts we know for sure. We can´t do it alone. There must be sparkles of joy, inspiration, trust, respect and truthfulness along the process. Suomenlinna sure brought me back to my roots, something that inspired me to work with communities in the first place. Communities are places for transformation, learning and support. We played with our edges, helped each other to shift our perception, let the structures go and put some back. We are humans, at times not so perfect and the processes were reflections of that. But somehow the outcome brought us in touch with the center of collective love that is the glue and platform for a better future.